Peel the papayas, cut open and scoop out the black seeds*. Cut the papaya into small pieces. Place in a large dip bowl. Mince the jalapeñas and garlic. 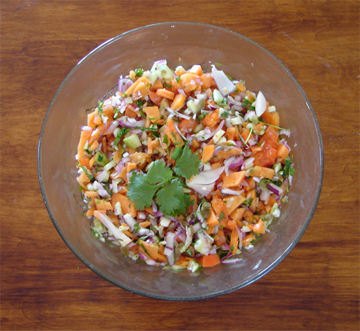 Mix into the papaya, along with the red onion, cucumber, cilantro, lime zest and juice. Toss until all ingredients are well distributed. Serve with sturdy Tortilla chips or as a topping on fresh grilled Swordfish, Mahi Mahi, or Dorado. Makes 2 1/2 cups. Hawai'ian papayas can be very expensive on the mainland so you might wish to use the less expensive larger Mexican variety. You may add a bit of the juice from the peppers for a really spicy salsa. *The seeds can be saved for use in a vinaigrette dressing. They will add a peppery-Indian cress taste.